Oh how I love this omelet. It's made of the simplest ingredients -- a tablespoon of butter, two eggs, a dash of salt, two tablespoons of jam and a sprinkling of powdered sugar. This is one of those dishes that is more than the sum of its parts. You can whip it up in just minutes, for a quick lunch, supper, snack, or even breakfast. The recipe comes from a fun little book I'm growing to love, Country Egg, City Egg by Gayle Pirie and John Clark. The authors use apricot jam, by the way. But I used some peach jam that was just crying out to be eaten. I'll bet any jam would be delicious. Over medium-high heat, melt butter in small skillet until frothy but not browned. Whip together eggs in a separate bowl, and add a touch of salt. With heat still on medium-high, pour eggs into skillet. Use wooden spoon to pull in the edges of the omelet several times so the runny middle part can slip out to the edges of the pan and cook. This helps the center of the eggs stay soft and creamy. Remove from heat. Put jam in middle of eggs and roll in the top third of omelet, and continue rolling. 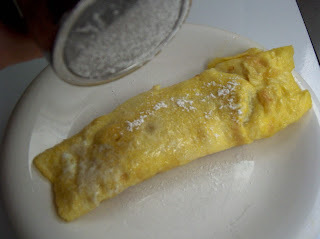 Place omelet on plate and dust with powdered sugar. This does look very tempting. I make my cheese omelets the same way. I am bored to tears with the cheese, but this sounds very good. This would be a good way to make omelets that would satisfy everyone, simply by changing the filling. Mine will be the one with the jam! I have never had an omelet with jam. My husband likes his with veggies, but next time I'm having mine with jam! OMG!! Never thought to try this combo.. it sounds fantastic! Oh a sweet omelet, how interesting!!! I have never seen it but I think I must try it for sure!! Maybe I'll sneak in a tbsp of peanut butter as well! Ooh, Marta, I'm not sure how peanut butter would be in this. I think what makes it work is the little bit of salt from the butter/eggs balanced against the sweetness of the jam/powdered sugar. If you try it with peanut butter, I'd love to hear how it turns out. Guess ya never know until you try . . . This looks amazing! It's really brilliant too, it reminds me of crepes! Yum! I like most foods, but I'll have to think about this. I'm having trouble imagining the egg+jam flavor. But I imagine I will try it, just because you've aroused my curiosity! Addhumorandfaith, it really is delicious (at least I think it is). The egg flavor's not too strong, so it does remind me of a fruity crepe. Oooh, I can't WAIT to try this. Sounds so interesting...and yummy!